La-Z-Boy Originals Kennedy 2 seater electric recliner and manual chrome handle recliner chair. Upholstered in full Mezzo Parchment leather. With nearly 100 years experience you get the fantastic comfort and durability you expect from Americas premier manufacturer of recliners. This cancelled order is available for rapid delivery direct from our showroom. 2 Seater measures 168cm wide x 94cm deep x 105cm high, the chair 100cm wide x 95cm deep x 105cm high. Another incredible bargain from the official La-Z-Boy factory clearance outlet. 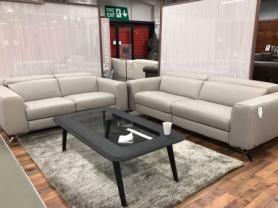 Sofa Max, the factory outlet for exceptional brands, often sells clearance stock on behalf of furniture makers. Examples are ex-display, returned, reconditioned or items damaged during delivery that have been repaired, cancelled orders/ overstock quantity. Offering these items at a significantly lower price means that the same level of warranty cover cannot be provided. Clearance items do not carry a statutory warranty. Sofa Max will always check items before sent out to make sure they are in excellent fit for purpose condition and all working parts are operational unless this is understood by the buyer and further concessions I've been mate. If you have an issue with your item not conforming to the above statement you have a period of 28 days in which to notify Sofa Max who will endeavour to rectify the problem or issue a refund exclusive of the original delivery charge. After this period of 28 days then the item is sold as clearance without warranty. Occasionally items are sold that are ex-display or customer returned and reconditioned, these items may show signs of use but will be supplied in good condition and fit for purpose.If you do not feel this warranty suits your purposes please call or email the store and we may suggest an alternative that can carry a manufacturers or our own 12 months warranty.Our customers satisfaction and happiness is paramount to us and we are happy to advise the lowest cost most effective way to repair items no longer covered by warranty.